måske omkring her sydvest for Lolland. MACR (Rapport om savnet fly) fastslår at flyet "sidst blev set omkring 54o35'N/11o10'E"
(14 km sydvest for Rødbyhavn). Han blev begravet på Svinø Kirkegård den 28. juni 1944. 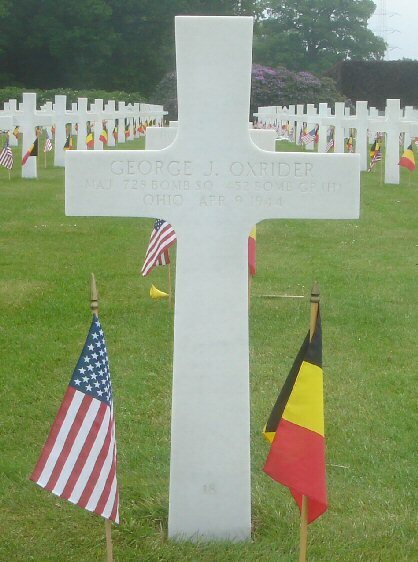 (Kilde: AOD) I 1948 blev han og andre Amerikanske flyvere fra Svinø flyttet til Ardennes American Cemetery i Belgien. (Kilde: FAF) Kom i tjenesten fra Ohio. Begravet på Ardennes American Cemetery Plot B Row 24 Grave 18 i BELGIEN. Se Monument for 46 amerikanske flyvere. B-17 Ball Turret, Ammunition og Ball Turret Gunner. 10 flyvere. On 9 April 1944 more than 500 American bombers were on a bombing raid on Poland and Germany. See 8 of the lost planes: Google Map 9APR1944. raid on Poznan (here), maybe about here south west of Lolland. The MACR (Missing Air Crew Report) states that it was "last sighted approx. at 54o35'N/11o10'E" (14 km SW of Rødbyhavn). He was buried in Svinø Churchyard on 28 June 1944. (Source: AOD) See Monument to 46 American airmen. In 1948 he was disinterred and taken to the Ardennes American Cemetery in Belgium like all other American airmen buried in Svinø. He still rests in Ardennes American Cemetery in Belgium. He entered the Service from Ohio. This B-17 was from 728 BS, 452 Bomb Group (Heavy), 45 CBW, 3 BD. See 452nd Bombardment Group. B-17 42-31352 at the American Air Museum.